We get asked this question a lot “What plants should I use on this new build house I am creating?” More than likely you have a few Ilex shrubs or maybe a Birch/Maple tree outside or even a full Laurel hedge! Can you imagine how bare your house front would look without the foliage populating your garden? This Blog is going to be aimed towards helping those of you who aren’t sure on what plant to get that lush green look, without it soon turning into a jungle to manage! 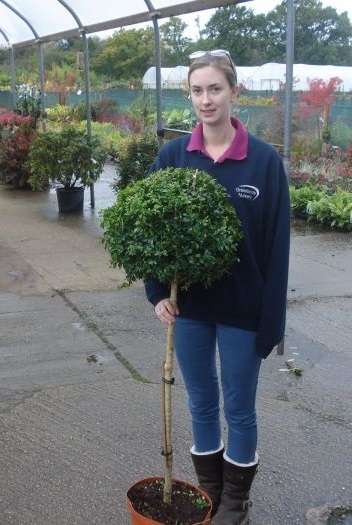 Right off the bat, if you are looking for hedging, nothing looks quite the same as a new Cherry Laurel Hedge, soon growing into a full established hedge once the plant has reached the desired height a light bit of trimming and your new hedge should look fantastic and is great for screening off new gardens. If you are interested we do have an existing blog all about some of the common diseases for Cherry Laurels and how to care for the plants here. With proper care, as you can see, the topiary plants make the garden so stunning. For this new build, you will not be looking for the same amount of topiary plants (unless you are building the next palace of Versailles, but you might want to consider the same shapes of topiary. Now you have a suggestion for a hedge and some great specimen plants to bring attention to the garden, you may just want some basic shrubbery groundcover. Lonicera –a useful bushy, evergreen shrub. A great alternative to box hedging, it has densely packed small oval leaves and creamy white flowers in Summer and it does grow faster than box as well. It is excellent as it can be planted anywhere and has a high tolerance of clipping as it is fast growing. Cornus- Or dogwood are deciduous shrubs with bright showy stems. They bear lance-shaped mid green leaves which have beautiful autumn colouring and small, star shaped flowers. Flowers are followed by loose cluster of strawberry like berries. Euonymus – Grown for their attractive colourful foliage and autumnal colours. The leaves are simple and vary in both shape and colour between different species. Be sure to take a peek through our selection to find the colour you are wanting! Skimmia - Perfect for planting in a border. Bearing small star-shaped flowers in spring, some of which smell fantastic. These are followed, on female plants by round fleshy, red to black fruits. These are just a few of the plants we have that would fit into a shrubbery, if you see anything else on our site that you find and would like to know a bit more about then please do get in touch with myself and I will be glad to answer any of your questions.